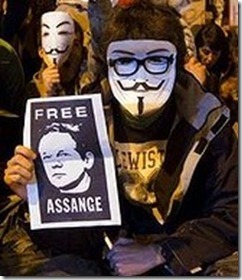 Assange Arrest– Has british police broken International Law. The Australian JULIAN ASSANGE , wanted by British authorities for breaching bail conditions after a court ordered his extradition to Sweden, is just hours from learning if Ecuador will protect him. If not, he faces being ejected from the embassy into the arms of police. WikiLeaks tweeted this morning that police in two large vans had arrived ‘‘to surround the Ecuadorian embassy in London’’ about midnight, local time. The Ecuadorian government will announce it decision on Assange’s bid at 10pm today(AEST). Two Metropolitan Police vans have parked directly outside the entrance of the Ecuador embassy in the west London building. Several police vans are outside the embassy, police have been seen entering through a side door and uniformed officers are standing guard at the front entrance. According to an Australian law expert., Any incursion by the British at the embassy would be ‘‘without modern precedent’’ and could end up before the international courts. "The Ecuadorian embassy enjoys protection under Article 22 of the 1961 Vienna Convention on Diplomatic Relations which precludes the United Kingdom authorities from entering the embassy without consent. Mr Patino told a news conference that Ecuador had received a written threat on Wednesday from Britain that "it could assault our embassy" if Assange was nothanded over. UK Considers Ecuador a small and powerless country with low risk in taking this bold step for this reasons. Poor decision making process by some London authorities. Police have clashed with a Huge protests at the Ecuadorian embassy in London as tension mounts over WikiLeaks founder Julian Assange’s bid for political asylum. Media Commentators have said that US is putting pressure on other governments to make the extradition of Julian assange to Sweden and then the US successful. A "citizen journalist" with the twitter account https://twitter.com/alburyj, was streaming the ongoing activity at the site , but the feed has since stopped. @alburyj is recharging his battery and will begin livestreaming as soon as he’s got power.